People can tend to have a love/hate relationship with their families, bosses, friends, and even spouses. They can be the sweetest people with loving intentions one second, and the next, say something so offensive that makes you want to call them every name under the sun and react negatively. Questions like “When did you gain so much weight?” or “When will you ever get another boyfriend?” or “Why haven’t you found a job yet?” can really hit below the belt and really set off your temper, if you allow it. People don’t often think about what they say before they say it, which can lead to disaster if the person they are speaking to (you) becomes offended. You have a right to defend yourself and speak your mind, but you can come up with a retort that allows you to express yourself while still being positive and polite. Finding the right comeback to deal with rude people isn’t always easy, especially if that person signs your paychecks. If you have been wondering how to handle your mother-in-law who can’t seem to keep her mouth shut about your weight, or your boss who shows no remorse when he gives you extra work to do, consider these comebacks the next time you encounter rudeness. A simple “thank you” speaks volumes when you encounter rudeness. Not only does it show the other person that you didn’t let their words affect you, it reflects maturity on your part. You chose not to ignore the person or get angry, but met both of those tactics somewhere in the middle. A “thank you” usually implies that you acknowledge someone’s thoughtfulness and are responding to that. However, in this case, your “thank you” will mean that you acknowledge the person’s rudeness and you choose not to let it affect you. That will shut the other person down quickly when he or she realizes that the comments didn’t phase you. You choose how to react in any given situation, so choose happiness. It will keep your thoughts and actions positive, and show others that their rude words simply cannot take your power from you. 2. I appreciate your perspective. Not only does is this an intelligent approach, it will show the person that you only wish to communicate in an adult manner, and not stoop to their level. Any rude comments reflect the other person’s shaky perception of themselves, so remember that when someone blurts out something tactless. They may want to bring you down, but you don’t have to let them. Show them that you will only continue the conversation with dignity and respect. They may actually respect you more by reacting in such a considerate way. If this doesn’t happen, shift your focus with this next tip. 3. This conversation is now over. If you find yourself too angry to respond to someone in a civil way, simply end the conversation. You don’t want to cause permanent damage to a relationship by losing your cool, but you also don’t want to disrespect yourself by pretending like the person’s comments or questions are acceptable. Choose to take the high road and not allow the conversation to carry on, and you will be able to keep your dignity while skipping a potential all-out brawl or heated argument. 4. Why do you feel that was necessary, and do you really expect me to answer? Especially in group settings, this will likely put the other person in check very quickly. Instead of getting the expected irate response out of you, they will meet a calm, cool and collected you, ready to talk things over sensibly and decently. Also, it will give them a chance to redeem themselves, and apologize to you in front of your friends, family or co-workers. Other people do need to know that you do not tolerate rude or uncalled for questions and comments, and that you will call attention to their uncouth behavior. If they say “yes” to the second part of your question, you can simply reply with “Well, it looks like this isn’t your lucky day,” and be done with the conversation. 5. That almost hurt my feelings. While a little on the sarcastic side, it tells the other person that you choose not to absorb their negativity. It also deals with rude people in a mature way, and will probably discourage the other person from making any other remarks once they realize you aren’t affected by them. While most people have a hard time saying these two words, it will benefit you to make the other person believe they were in the right in what they said, and will likely cause the conversation to be cut short. What more can they say after this comeback? You admit their rightness, and then disengage from the conversation. While you might not get as much satisfaction by using this tactic, it will put a damper on the other person’s enjoyment since they won’t get a rise out of you, which is what they were after in the first place. 7. You always have something negative to say, don’t you? This takes the attention off of you and back onto them, making them think twice about their choice of conversation topics. Not only will you, rightfully so, draw their focus onto their own words, but also force them to reconsider what they say in the future. Speaking your mind when a person repeats behavior that offends you is never wrong or uncalled for; if you feel you need to draw attention to someone’s behavior, then listen to your gut. The person’s negativity likely affects other people besides you, so making them aware of their own toxic behavior will actually benefit you and others in future situations with this person. 8. I love myself, and I love you, too. This may only apply in certain situations with friends, family, and your spouse. If you say it to your boss, you might either get a strange look or get your named removed from the payroll, so use it at your discretion. However, this comeback had to make an appearance on the list because of its effectiveness at shutting down rude people. Kindness always prevails over negativity; darkness cannot thrive where light is present. When you express to the other person just how much you love life and others, their comments become irrelevant and lose power quickly. Their sour mood and bleak outlook on themselves, you, and life will not be a match for your extreme happiness and zest for life. People also aren’t used to such raw emotion from others, and will probably be too surprised to formulate a proper response. Your words have the ability to boost the entire energy of a room and promote more positive conversation. You can’t go wrong with that! This reaction will definitely catch the offender off-guard and make a rude person feel embarrassed for even making the comment in the first place. For instance, if your aunt brings up your recent job loss at dinner again, just laugh. It will make the present moment seem a little less serious, and will send a message that you don’t let other people’s rude comments affect your mood or outlook on life. Bottom line: You choose how to react in any given situation, so choose happiness! 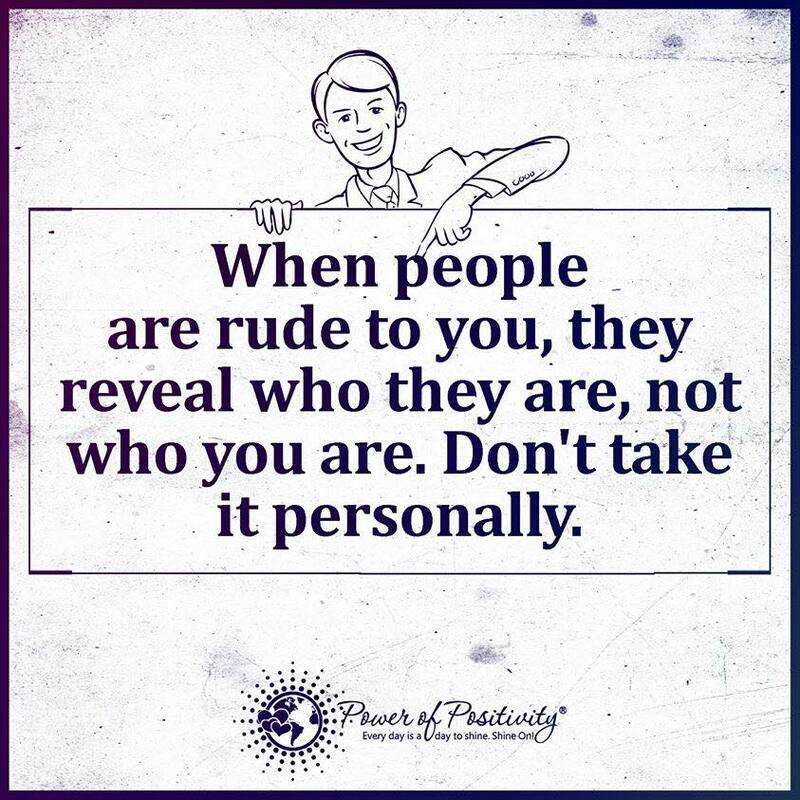 Add to the discussion below: How do you positively react to negative, rude people?